Old vines denoted wines that have seventy-plus years on the clock. Venerable the vines may be, the wines themselves are utterly vital and balanced, finding the point where intensity from low yields meets complete minimalism (in that there is no flavour in the wine that does not connect with the whole). Old vines, after all, farmed organically or biodynamically in healthy soils, form root systems that penetrate the soil deeply, absorbing minerals and microbiological organisms, which in turn animate the wines and give them extra flavour. Domaine de la Senechaliere Folle Blanche (vieilles vignes) was akin to great Muscadet, for want of a better analogy. Or 1er cru Chablis, if we must be vulgar. Oyster shell and lemon filled out in the mouth followed by a cooling freshness and a touch of angularity. The greatest Folle Blanche we’ve tried. Marc Pesnot makes a necessity a virtue. Domaine Matassa Alexandria (Muscat of Alexandria) was multi-dimensional – a wine that swerved around expectation, and continuously developed in the glass. An old wild child, its low PH gave the impression of vaulting acidity in the form of a swag-bag of crushed minerals. Barral Blanc from a tiny parcel of old vines Terret Gris and Blanc in Faugères, was golden-amber in colour. The energy of this wine was astonishing, as if the very garrigue and schistous soils had been distilled into vinous form. Domaine des Roche-Neuves Les Memoires, from 105 + year old vines, demonstrated the genius of Cabernet Franc. A lissom, linear wine, exuding gentle strength and remarkable length. Mercurey La Plante Chassey, Dominique Derain contains 20% Pinot Beurrot. Latent power allied to limestone crunch – this was another winner in this top-class section. “Lo Vielh” Clos du Gravillas is indeed the old one, some gnarly ancient Carignan fermented and aged in large barrels, belting out rough-hewn country flavours, drenched with aromas of the garrigue and beguilingly seasoned with spice. Food with this agester! Macon-Cruzille Manganite Clos des Vignes du Maynes was a desert-island Gamay, bristling with freshness and crushed maximum minerals. Julien Guillot’s wines ripple with rare authority. Orange/skin contact – the clue was in the title! A category to pay homage to the glorious diversity of skin-maceration wines, some being deep amber, some orange, some pinkish-hued, some golden-yellow. The wines all had varying texture and varying flavours based on the degree of extraction or infusion. Invidious to pull out favourites but here we go. Dario Princic’s Jakot, twenty days on skins in open top barrels was aromatic and refined, Erich and Michael Andert’s Rulander (Pinot Gris) reminded me of pink grapefruit – it had a bright precision that one wouldn’t expect from this grape; Tenuta Il Grillo’s Baccabianca was crazy Cortese, 40 plus days of skin contact giving the amber colour and grippiness, and adding texture and complexity to a wine which is all about nuance – gentle orchards, herbs, dried spice and minerals; A Demua (Cascina degli Ulivi) comes from a blend of five grapes from an ancient co-planted vineyard with one month on grape skins. Extraordinary wine – flowers, orchard fruits and spice. It was particularly poignant to try the wine given the sad recent news about the passing of Stefano Bellotti. Sam Vinciullo’s Warner Glen Sauvignon was a turbid ten-day skin “contacter”, the nose screamed elderflower fool, the palate very fine and fresh with grape-skin chewiness; Bow & Arrow La Chesnaie (Eola-Amity Hills, biodynamically-farmed), reminiscent of stone fruit, guava, mint and a whiff of Rum Agricole showed that – in Oregon – Sauvignon can go the ball! Oh, and we loved Pat Sullivan’s Waterskin Sauv/Sem. And more than a swift postscript for Georgas Family Retsina of Mesogaia, Savatiano with two weeks on skins, given a fresh Aleppo pine resin makeover. The extra maceration gave the wine more definition. This was delicious and overturned a lot of expectations. Pots and Eggs had plenty of orange wines too with the added dimension of…claymation! Aligote Face au Levant is Dominque Lucas’ special Aligoté from centenarian vines, 20% of which are ungrafted. Working the soil is done by horse. The terroir is composed of big white stones and white clay soils. Winemaking takes place in amphora. This is as astonishingly complex wine by any standards. The nose is very elegant, with notes of pear, candied lemon and orange blossom. The palate is full and energetic wherein a ripe acid mineral-edged quality perfectly animates the mid-palate and a saline and buttery finish provides excellent length. A sipper rather than a quaffer, so see-you-later-Aligoté! To COS Pithos Rosso: 60% Nero d’Avola and 40% Frappato, is fermented in large buried clay amphorae. Delightful nose of sweet violets and a whisper of spiced cherries. The wine was very smooth, almost silky and the bright berry flavours cascaded over the tongue to their lip-smacking conclusion. Foradori Pinot Grigio Fuoripista spoke of superb biodynamic farming allied to natural winemaking in Spanish tinajas. Bright and bonny onion-skin-coloured wine with its delicate perfume of dried and fresh flowers and cool energetic palate of river stones and herbs. Enchanting. Sylvie Augereau’s Peau Chenin (nine months on skins in Georgian qvevri) had a fabulous bright golden colour with aromatic complexity mixing white flowers, candied lemon and apricot with some hints of honey. Kelley Fox Maresh Pinot Gris was a different shade of gris and managed to be both joyous and serious. Complexity on the nose (roses, wild strawberries, and some exotic notes) and in mouth where the tannins were quite beautiful. A tasting describes the journey of a wine company and its confidence to organise something a little different. I would love wine buyers to return to their restaurants and retail outlets and examine the way they sell wine, and possibly refresh their lists by making the categories in which they present wine a lot more imaginative and interesting. Pet Bubbles was a category for pleasure, rather than a selection of wines based on intellectual/aesthetic criteria, a little section designed as a rest-and-refresh-stop. Why do all tastings need to be a slog? Come to refresh the palate not with searing champagne or lush leesiness, but fruit-and-terroir sapid sparklers. A Pel Ancestral Loxarel is Xarel.lo fermented in tinajas, the wine had a chalky almost saline purity; Fuchs und Hase Pet Nat Vol 1 was a real charmer being cloudy deep yellow, sporting aromas of fresh apple whilst the textured palate had a good balance of sweetness and acidity – good grapes makes good pet nats; Grace and Favour Pet Nat made from the hybrid La Crescent in the alpine climate of Vermont, was wildly floral with flavours of orange marmalade, cloves, wild mint and strawberry leaf. Unfiltered and no sulphur added, one of the most energising and uplifting sparkling wines I have ever tasted. O2/Flor was an amalgam of dry sherries, flor and oxidative wines. Bianchdudui is/was Vittoria Bera’s accidental oxidative/flor Moscato from Asti – fifteen years under flor, in fact. Happy accident! The nose yielded an initial impression of sweetness, the palate so complex and full with abundant spice and rich nuttiness. La Panesa Fino, Emilio Hidalgo (fifteen years average age under flor), the most generous dry sherry imaginable, pale yellow in colour with a distinctive pungent bouquet acquired during its development in oak casks. Full-flavoured with a satisfying aftertaste, a wine that enramalamadingdongs on your tongue long after you have swallowed it. Pol Opuesto Chardonnay is the result of using the same Chardonnay grapes to make three different styles of wine and to bottle each separately: one with skin maceration, one with microbiological ageing under a veil of flor, and one “normal” white wine aged reductively on its lees with batonnage. However, every time the vigneron tasted the three different wines throughout their ageing process, he always finished by combining the three components together in a glass, feeling that the sum of the three to be greater than the parts. 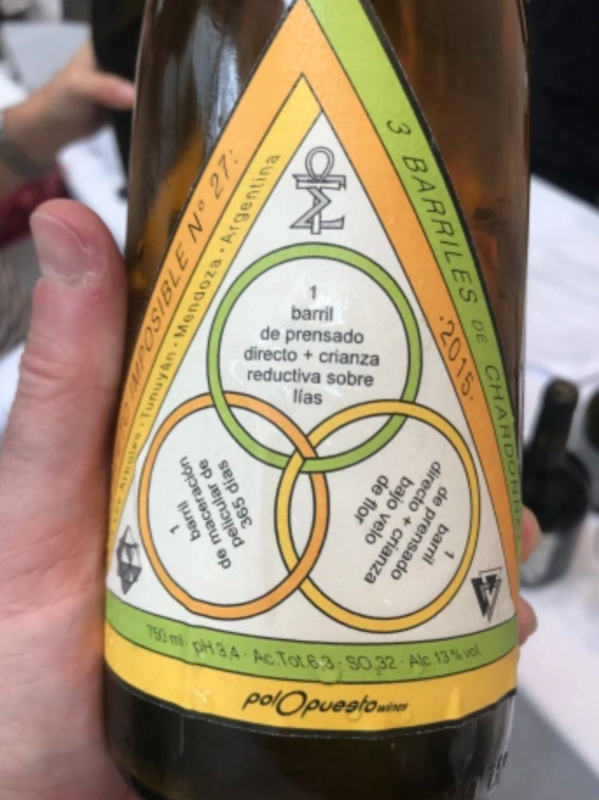 Henceforward, at bottling, he duly blended them together and called the wine El Objeto Imposible Nº 27: 3 Barriles de Chardonnay (aka, El Objeto Imposible). A mouthful to say. And a mouthful to drink. Vecchio Samperi is described by De Bartoli as a Vino Liquoroso secco. It’s named after the territory that houses De Bartoli’s country estate (the old Samperi). The wine is a prestigious “vergine” wine made using the traditional solera method, in which small quantities of young wine are added to wines of older vintages as they pass through a sequence of wooden barrels. The complex, harmonious result celebrates the fruit of many harvests. The wine was dry, intense and mellow with flavours of chestnuts, brazil nuts and orange peel and a finish that seemed to last for aeons. This was like tasting liquid history. Indigenous celebrated autochthonous grapes, including some absolute unicorns with hens’ teeth (does that even come close to making sense?). The Plaimont co-op have been working on lost Gascon varieties, as well as rediscovering and re-animating old vineyards. 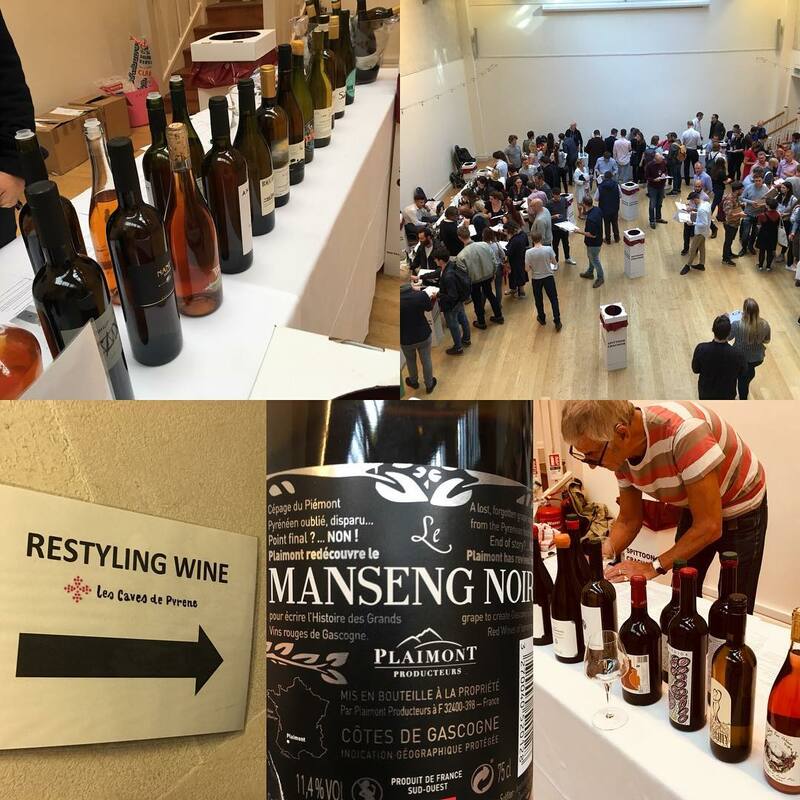 The Manseng Noir was one of their native grape renewal projects, an inky red with an Atlantic-breezy, crunchy palate, characterised by lashings of black pepper. 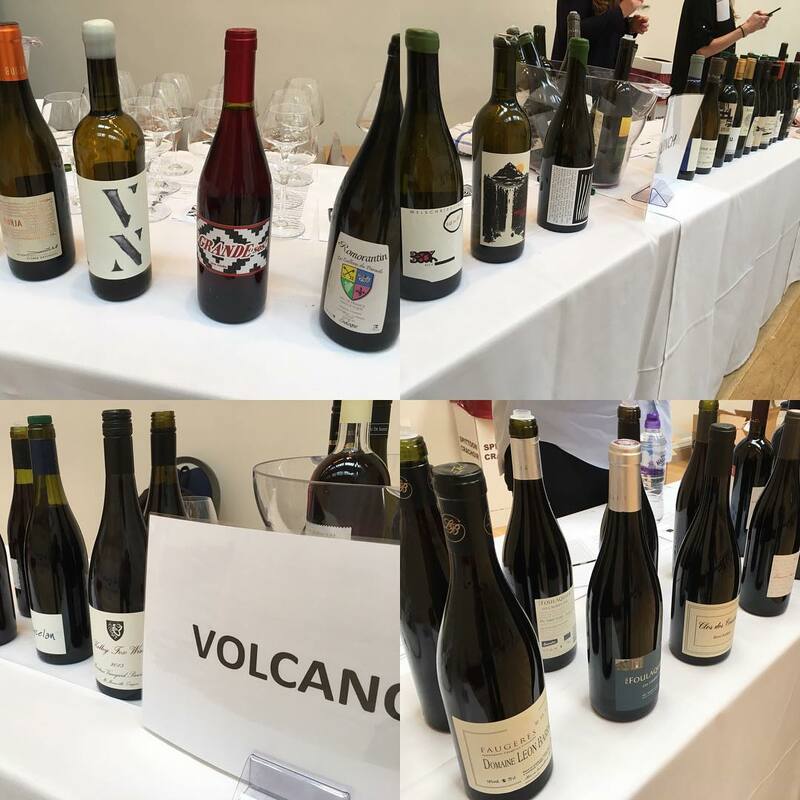 Courtois features yet again in the round-up of outstanding wines. In this section it is Les Cailloux du Paradis L’Icaunais. L’Icaunais means inhabitant of the Yonne. There were 9,000 hectares of the Gascon (no relation) variety in the Yonne département (Northern Burgundy) before phylloxera. According to the official records of the varieties surfaces as of 1988, there were only 3 hectares of Gascon left in the whole world. Yields are naturally low and the wine spends between 18 and 24 months in old futs. The mouth was savoury and mineral and the length terrific. There are only a tiny handful of producers working with Gascon. Even more unusual is La Garagista Loups-Garoux. La Garagista is Deirdre Heekin and Caleb Barber’s project in Vermont. The grape varieties are all hybrids (riparia x vinifera) as only the sturdiest vines will survive the extreme (alpine) climate. This lupine wine, from Frontenac Noir, is made essentially like a ripasso on the vine. Because of its naturally high acidity, they wait until about half of each bunch is raisined then harvested the whole bunch, waiting for the tension between the raisined and the fresh fruit. Bitter chocolate and damsons with gorgeous souring acidity. Not for the faint-hearted (but I’m not faint-hearted!). Juice and juicier could have been called everyday drinking fridgeable reds, whole bunch, often carbonic, light in alcohol, bags of fruit and freshness. After the intensity of the flor/oxidative section an opportunity to relax with cooling wines. The section teed off with Nico Carmarans Maximus, an example of natural minimalism in a glass. Scarcely venturing north of 11% it nevertheless sported its usual brilliant purple raiment and positively billowed with berry fruit. There was the graphite/slatey undertow and yeasty seasoning, but, like so many of Nico’s wines it was a lipsmacker. Adegas Guimaro Tinto (Joven), made from de-stemmed grapes, with a small proportion as whole-cluster, was all freshness and purity. Berry-bright and fresh with suggestion of cherry blossom, it showed gentle fruit-jelly glycerol up front, yielding to finely-grained crunchy tannin length and gentle closing acidity. Mencia plus a crew of Galician locals. Burgenland reds can often be a bit of a mouthful, but the St Laurent Bambule from Judith Beck with its wild dark berry fruit, cassis and spice and lively acidity is fantastically well-balanced and crunchy (that word again). 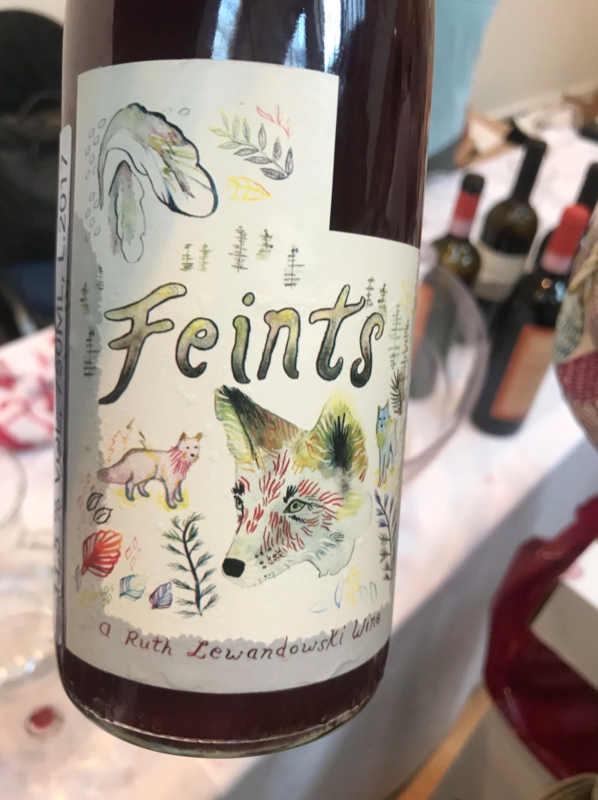 Feints from Evan Lewandowski is one of those not quite red and certainly not rosé critters. This Piedmontese quartet (Arneis, Dolcetto, Barbera and Nebbiolo) was a compelling mix of fruit and earth; all raspberries, tamarind and with a spicy anise and bay laurel component as well. Juicy but not loosey – all bound together by crisp acidity and peppery tannin. Decanter betokened structured and profound wines that might prefer to tarry in a carafe and heartily engage with oxygen. Built on the pillars of tannin, acidity and long barrel-ageing, these were what might be termed “meditation wines”. Even with their existing bottle age one might wish to leave them in the wine rack for a few more years. Paolo Bea’s Sagrantino di Montefalco is amazing: the grapes are left to macerate for 39 days. It has a dark purple hue with a full, powerful nose of raisined berries and smoke. The palate unfolded an array of blackberries, currants, cinnamon and clove, and was mouth-filling, warm and dense. The 2010 has so many more miles on its clock. Some orange-hued wines seem positively to shimmer in a decanter. The wines of Mlecnik start deep golden and go into amber mode – yet still glisten. Mlecnik vineyards are in Bukovica, Vipavska Dolina (Vipava Valley). The Ana Cuvee is based on the traditional notion of a field blend and contains Chardonnay, Malvazija, Sauvignasse (aka Friulano) and Rebula. Beautiful wine, observing the fine balance between aromatic fruit and phenolic structure. Elena Pantaleoni’s Ageno is built on the back of the thick-skinned aromatic Malvasia grape. Showing is warm-climate origins, this was amber-hued with exotic notes of tangerine and something of peach warming on a windowsill in the early autumn, then a fine peppering of spices (cumin, mustard seed) and reviving flick of pickled ginger. The 2012 vintage revealed a distinctive umami component of roasted bacon fat. Now a swift digression about Trentennale from our friends at Il Paradiso di Manfredi. Another example of appellations falling a long way from the tree of sanity. 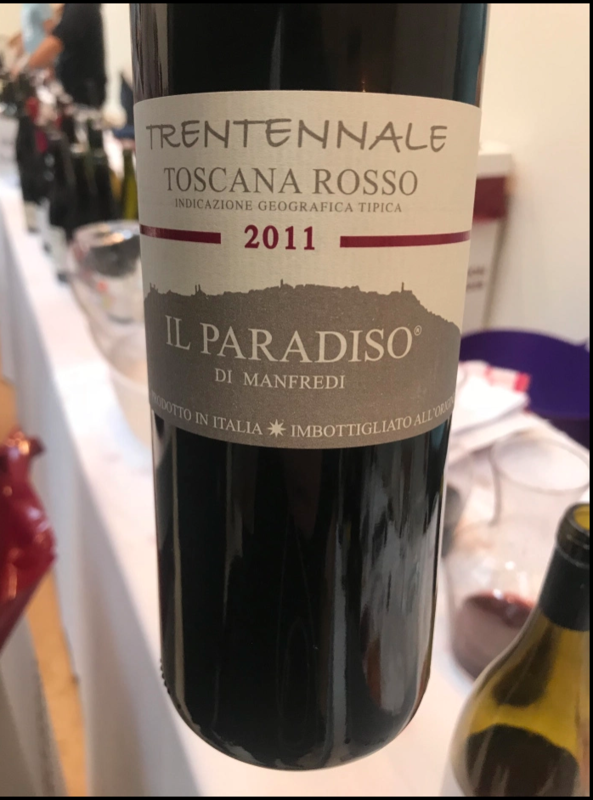 The wine was everything you hope for in great Sangiovese, displaying wicked wild cherry fruit along with notes of herbs, leather, liquorice, pepper and spice and nascent prune, tar, olive and tobacco aromas. It was so savoury that the food you are thinking of cooks and present itself at the table. Reader, we loved it. And so did virtually everyone who tried it. Sepp Muster’s Sgaminegg comes from the best vineyard of the estate with pure Opok soil, the sparsely-foliaged vines yielding tiny grape clusters (15-20 hl/ha). The winds from the Koralpe play their influence here directly. Sauvignon and Morillon are matured in wooden barrels, blended and bottled after 22 months. The wine has a cool, austere feel as if the very limestone rocks had fermented slowly with the grape juice and released their stony essence into the wine. The carafe was a necessary adjunct for this thrillingly nervous wine. There were so many highlights amongst the 170 wines being poured. The main idea behind the category layout, was to suggest that every wine is the result of hundreds of factors, from the place that it comes from, and the soil the vines grow in, to the method of farming, the nature of interventions, the personality of the grower and the context in which it is tasted. Categories are arbitrary in the final analysis, but you can make it interesting to taste wine by creating novel juxtapositions, guiding drinkers to interpret wine with reference to flavour and feeling rather than the according to archetypes of grape variety or region. One could take this a lot further and really invent some jazzy intuitive categories – and maybe we will one day. A tasting also describes the journey of a wine company and its confidence to organise something a little different. I would love wine buyers to return to their restaurants and retail outlets and examine the way they sell wine, and possibly refresh their lists by making the categories in which they present wine a lot more imaginative and interesting.